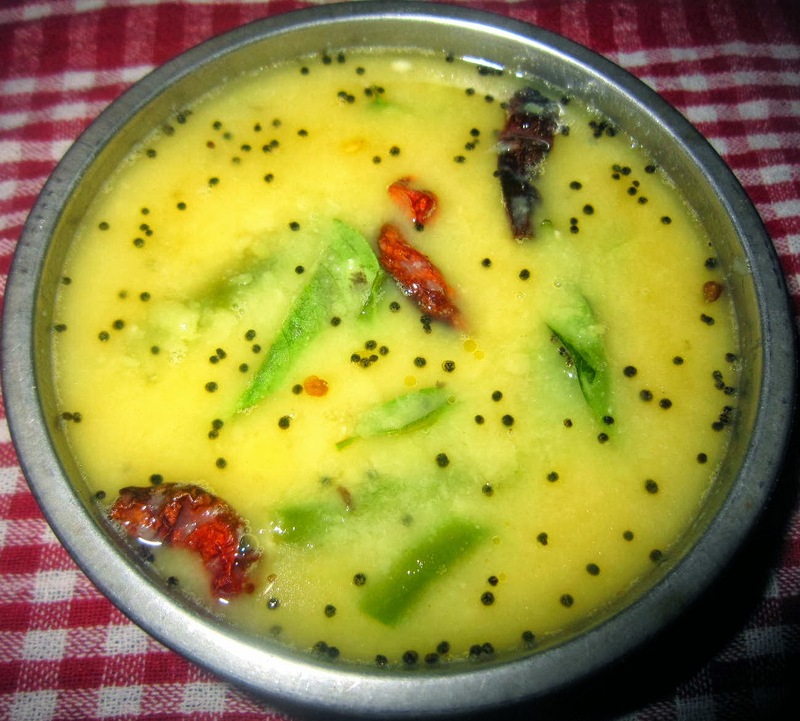 Dalithoy: Dalithoy or daali toy is very simple and healthy soup made with split yellow lentils in the Malvani cuisine of the Konkan region of India. Dalithoy is the most basic and most loved dish in Konkani cuisine. Daali is the Konkani word for daal or lentil. Dalithoy goes well with pickle, pappad and other dry curries. Konkani style dalithoy is not spicy. Wash toor dal under running water. Transfer the washed toor dal to a pressure cooker. Add in the slit green chillies, grated ginger and turmeric powder. Pressure cook for 4-5 whistles or till the dal is cooked. Once the pressure is naturally released, take the dal out and mash it thoroughly (I took the chillies out and then gave a round in the mixie). Heat the ghee in a kadai, on medium heat. Add in the mustard seeds and asafoetida. Once the mustard seeds splutters add the red chillies and curry leaves. Add in the mashed dal. If the dal is too thick, you can adjust the constituency by adding water. Season the dalithoy with salt. Take the dalithoy of the heat. Serve hot dalithoy with white rice and a pickle of your choice. If you have any queries regarding the Dalithoy recipe, please leave a comment.